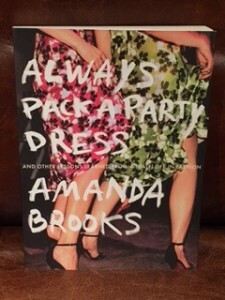 A few weeks ago I read, “Always Pack a Party Dress” by Amanda Brooks. It’s the story of the author’s “accidental” life in fashion – starting out as a famous photographer’s assistant, her early 20’s in New York as a “gallery girl”, and eventually becoming Fashion Director at Barneys New York. I’m sure you’ve already guessed that this isn’t exactly “War and Peace” but it truly is a fun read – and if you have any interest at all in fashion, the little tidbits she gives about working in the industry are really amusing. One favorite? Her explanation about the Met Ball – how one gets invited and determines what they’ll wear, only to have it vetoed by Anna Wintour herself. If the book does nothing else, it really enforces the idea of “it’s all who you know” when it comes to getting a job. That may also be the most frustrating thing about the book – Brooks seems completley oblivious that she was pretty much born into a very well connected family. This allowed her to attend boarding schools with the likes of Ralph Lauren’s son, assuring her an instant interview at the company down the line. She had parents who regularly “hung out” at a New York hot-spot frequented by aforementioned famous photographer where the maitre d insisted on introducing her to him. Oh, did I mention she also attended college with Diane Von Furstenburg’s son, whom she also dated? And lo and behold DVF herself mentored her and lated hired her as a consultant – go figure! Her roommate in college? Diana Ross’ daughter, Tracee Ellis Ross. You can see her life certainly wasn’t short on A-list connections. That’s not to take away from any of her own personal drive, talent, or hard work. But she tends to write in a way that’s very much, “If I can do it, anyone can do it.” This isn’t a girl who stepped off a plane in New York after growing up in South Dakota and wanted to make it in the big city – she certainly had a leg up, and parents who were wealthy enough to support her in the early days where jobs with even the most fabulous of people didn’t pay enough to cover the rent in Manhattan. That lack of awareness aside, her stories of mixing and mingling with fashion’s elite are well worth the read. She also includes photos for referencing the various tales, and odes to several of her fashion heros (some you’ll know, some you won’t) that are all very enlightening. As the weather is getting warmer, if you’re looking for a book to take with you poolside or to the beach, add this to your list.